"The UK's number one Buddy, Marc Robinson, arrives with the fabulous Buddy Holly - A Legend Reborn concert show. Marc revives classic hits like Peggy Sue, That'll be the Day and Oh Boy. 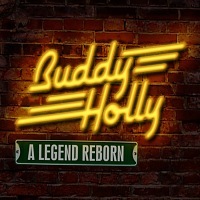 Backed by a band reminiscent of the Crickets in their Fifties heyday, Buddy Holly - A Legend Reborn is an authentic slice of rock 'n' roll nostalgia that ensures Buddy's incredible legacy of unforgettable hit songs lives on."